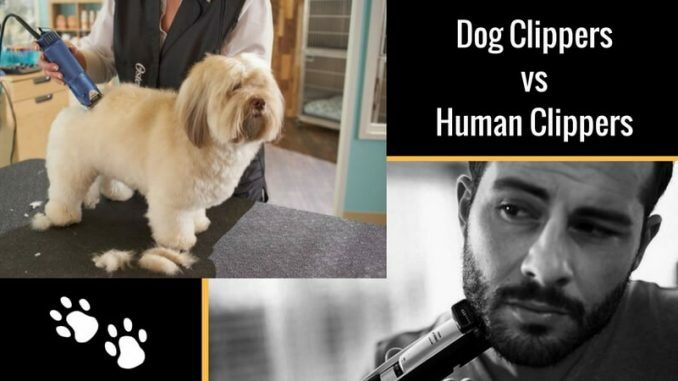 Home » Blog » Comparision » Dog Vs Human Clippers: Can You Use Regular Clippers for Dog? When it comes to cut or style our hair, we do a lot of research and take many opinions before going to the saloon. We want to see whether the particular cut or the color suits on our face type or cheekbones or not! Some of us also match the decided hairstyle to some iconic face of the Hollywood. Isn’t it? Just like that, we tend to care about our pet’s grooming. Mostly, we pay careful attention to their style, styling products, and the tools which can help us to groom them. Some people believe that there are some specific tools available in the market which can be helpful for both – pets as well as humans. On the other hand, it is said that we should not use a regular hair cutting tool to cut the hair of our beloved furry friends. All the animals, including our pets, require a more specialized kit to serve this purpose. In this article, I am going to tell you the exact difference between dog clippers and human clippers. Let’s find out together. Human clippers and dog hair clippers look very similar, and that is the reason most of the pet owners start using their trimmer for the dog’s grooming purposes. But, these tools are not same regarding their key features. Have you ever wondered that is it safe? Is it okay to use human clippers to groom a furry animal? Here is the answer to all these questions – Dog Clippers vs Human Clippers. It is not at all preferable to use human clippers for cutting or grooming dog’s hair because of the significant changes of the blades. The human hair tool may stick in between the dog’s fur and annoy him. If you have a furry dog having thicker hair coat, then human clippers are not at all suggested because it does not have the expected speed to cut the dog’s hair. They are just meant to cut down lighter hair, where the dog clippers are specifically designed to have the power to move across the thick hair layer without causing disturbance to your pet. Talking further about the dog clippers vs human clippers, I want to inform that the overall design of dog clipper is different than the human’s trimmer. Dog’s clippers have the inbuilt capacity to have the power even to cut the clump of thick hair without pausing or stopping the machine. The dog clippers also designed to have more blades, and that too with the different lengths. Human clippers do not have longer blades. Why Prefer a Dog Clipper? Your innocent and sweet little pet may get scared of the human clippers because of its blades and too much scary noise. They can also hurt your pet’s skin and leave some allergies, scars, or cuts. So, I suggest not to use human clippers we see on some barber shops or salons and equip yourself with the high-quality dog clippers as well as dog nail grinders, which can become your one-time solution to groom your furry baby from paws to ears. Keep some handy treats nearby to make your pooch happy and his favorite brush to comb his fur. I hope you have got all the answers to your confusions and now clear what type of clipper you should use to groom your favorite companion. Stay safe, take extra care, and treat your dog like he is the ‘one and only’ for you. Share some love to keep your pet healthy, happy, clean and tidy!